This rhyme, which describes King Edward I.’s expedition to Scotland in July 1300, and his siege of the Castle of Caerlaverock near Dumfries; is of great interest to students of heraldry for the descriptions it contains of the banners and shields of more than one hundred nobles and knights. The present (somewhat condensed) translation into English verse is an attempt to capture the spirit of the rime rather than to render it word for word. For the French blazon and biographical information on the knights see Gerard Brault’s Aspilogia III. In our Lord’s year thirteen-hundred, on St. John’s day, at Carlisle Edward held great court, and ordered that all men in little while should prepare to march on Scotland, ‘gainst his foemen of the north. Ready were they to the hour, and the good King led them forth. Not in coats and surcoats rode they, on their chargers dearly-bought, but well armoured and securely, wary of surprise assault. There were richly broidered trappings of or silk or satin made, many a lovely lance-head pennon, many a banner proud displayed. Far was heard the horses’ neighing; far-flung o’er the hills and vales were the sumpter-beasts and wagons bearing stores and tents in bales. Through fair days, by easy journeys, moved the host in squadrons four. Hear the roll of the companions, and the banners which they bore. Henry the good Earl of Lincoln, heart aflame with valour sure, led the van, his silken banner saffron with a lion purpure; with him, Robert le FitzWalter, skilled in arms and prompt to wield : in his banner, ‘twixt two chevrons a red fess on yellow field;” also William styled the Marshal — office he in Ireland held — there unfurl’d a scarlet banner with a golden bend engrailed. Hugh Bardolf, of noble presence, rich and courteous and bold, on an azure banner carried cinquefoils three of finest gold. Fifth I name a lord much honoured, Philip Lord of Kyme, who bore on his banner gules a chevron set about with crosslets or. arms like these, but one bar fewer and a quarter gules instead surcharged with a yellow leopard, John de Lancaster outspread. Neither dumb nor deaf in battle William Vavasour is found; his a very striking banner — sable daunce on golden ground. John de Holdeston, prompt in warfare, gules with fretty silver showed. Robert le FitzRoger’s banner, with the Earl’s ranged as they rode, quartered was of gold and scarlet, over all a bend of sable; John, his son, de Clavering surnamed, bore the same with a green label. Thus far of the train who followed Lincoln’s Earl, their well-loved lord. Him, the Constable companied — gallant Earl of Hereford; he displayed a silken banner, blue and deep in tint, which bore, with a silver bend gold cotised, six lioncels rampant or. With him, Nicholas de Segrave, fair in body and in heart, whose brave sire the garbs relinquished for the lion, to impart to his five good sons example of noblesse and valour linked; Nicholas bore his father’s banner with a label gules distinct; John, the eldest (whom the Earl Marshal, being absent, bade uphold his high duties) bore undifferenced, black, a silver lion crowned gold. He as harbinger found lodgings; but the Knights would never sleep till each pass they had examined where a stealthy foe might creep. John Earl Warren, well accustomed to commanding men of honour, led the second squadron; checky or and azure was his banner; while his nephew Henry Percy — sworn the Scotsmen to outfight — bore on gold a lion rampant azure, very clear to sight. Robert le FitzPayne, who followed, there his scarlet banner flew with three lions passant argent, over all a baston blue. Walter Moncy, of this meinie, checkers bore of white and red. Aymer de Valence, the valiant, beautiful his banner spread buruly argent and azure with red martlets bordered round. Nicholas Carew, in Ireland for his feats of arms renowned, bore three handsome lions passant sable on a yellow ground. Roger de la Ware was with them — he a wise and gallant knight — bearing gules, a lion rampant set about with crosslets white. Guy the Earl of Warwick — better neighbour none, as I have told -bore upon a banner scarlet crusilly, a fess of gold. and John Beauchamp, high in courage, bore a banner wholly vair. whosoe’er incurs his anger; but his kindness kindles still to all men who seek his friendship, or submit them to his will. was the banner which he carried, brightly checkered gold and blue, bordered gules with yellow leopards, quarter ermine sur le tout. John de Bar I also saw there; on a banner blue he bore. in a red engrailed border, crusilly two barbels or. William Grandison’s fine banner paly white and blue displayed, on a bend of gules three eaglets richly gold and fairly made. Upon gules, a fess engrailed white Elias d’Aubigny set, but of gules entire the banner of Eurmenions de la Brette. Hugh de Vere, the Earl of Oxford’s younger son, not cloth contented, but good silk, and long and narrow: quarters gules and gold there painted,in the first a star of silver, all in border black indented. John de Rivers had his trappings red and sewn with mascles or, similar was the apparel Maurice de Créon there bore. Strength from wisdom drawing, Robert Lord de Clifford’s mind is bent on his enemies’ subjection. Through his mother, his descent comes from that renowned Earl Marshal at Constantinople said to have battled with a unicorn and struck the monster dead. All the merits of his grandsire, Roger, still in Robert spring. Of no praise is he unworthy; wiser none was with the King. Honoured was his banner, checky gold and blue, a scarlet fess. Were I maiden, heart and body I would yield to such noblesse! Hugh Despenser, on his charger fierce in mellay, quarters spread white and gules with a black baston, fretty gold upon the red; and good Hugh de Courtenay’s banner I have not forgot, be sure: gold, it was, with three red roundels and a label of azure. Aumary de Saint Amand, who claims a place among the bold, or and fretty sable carried, on a chief three roundels gold. John d’Engaigne’s fine banner, scarlet, crusilly a dancette or; gules, and in the dancette’s stead a fess with six gold martlets bore Walter Beauchamp — him I reckon with the best of knighthood, but for his rashness (never yet was Seneschal without a “but”!) Light of heart and all men pleasing; banner gold and pennon bore with a black engrailed saltire, one by name John Botetourt. Splendid was Eustace de Hache’s gold with scarlet cross engrailed. Adam Welles had or, a lion rampant sable double-tailed. Handsome Robert Scales flaunted silver scallop-shells on scarlet. Touches, chevalier of worship, carried gules with yellow martlets. Banner gules, a lion argent, there the Earl of Lennox flew, and upon a silver border roses of the field’s same hue; Patrick of Dunbar, his son, bore likewise with a label blue. Richard Suwart carried sable, a white cross with ends florette; sable, too, bore Simon Fresel, and with silver roses set. Brian le Fitz Alan, saw I, full of courtesy and honour, barry gold and gules displaying in a very splendid banner. this the same as Hugh Pointz carried — difference there was none at all —which was cause of strife between them, and a marvel to men all. Roger de Mortaigne with ardour to win worship was imbued; he on gold bore six lioncels rampant azure double-queued. Handsome Huntercombe had ermine and two red gemelles thereon;while the blue of William Ridre with gold crescents brightly shone. Thomas Furnival on horseback did not look like one who slumbered; in his banner white, a bend and crimson martlets six he numbered : John de la Mare’s scarlet banner with a silver maunch was dight. John L’Estrange displayed red trappings with two lions passant white. John de Grey I also saw there, bearing barry white and blue with a scarlet bend engrailed. Also William Cantelou — man of honour never failing; gules with a fess vair, he bore, ‘twixt three fleurs-de-lis, each springing from a leopard’s head, all or. Hugh de Mortimer — well knew he how to win him friends — was there, raising high a crimson banner charged with fesses two of vair. 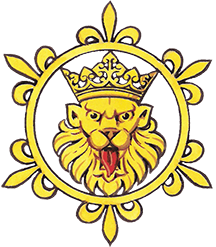 Ends the roll of the third squadron with Simon de Montagu bearing in his shield and banner griffin rampant gold on blue. The fourth squadron was commanded by young Edward, the King’s heir; Seventeen, he was, and handsome, sensible and debonair. Well his charger he could manage, and in this his first affray eagerly a chance he looked for, proof of prowess to display. Arms he bore of the good King his father, with a label azure. May God grant him grace and courage to his royal father’s measure! William Leybourn, man of action knowing neither buts nor ifs, had on banner and large pennon blue, white lions rampant six. Roger Mortimer bore always, and on either side the sea, a shield barry, the chief paly and the corners gyronny gold and blue, a scutcheon ermine. He and others named above guides and guardians to the King’s son were ordained, and to him clove. How to place such men in order? For Saint-John and Latimer, being skilled in martial matters, should have kept the squadron’s rear —two more valiant and more prudent men you would not find elsewhere. Thomas, Henry- cousins to the King’s son-did with these forgather: sons were they of the Lord Edmund, late the King’s beloved brother.Earl of Lancaster, was Thomas; these the arms he did advance (not desiring any nobler! ): England with a label France. Henry, who at all times studied his good father to resemble, bore his brother’s arms with baston azure but without the label. Well and splendidly equipped was William Ferrers, who revealed arms vermilion, therein mascles gold and voided of the field. Well supporting these was one whom doubts and fears did deeply move till from suffering delivered by the Lady Gloucester’s love; gold three chevrons gules the banner which that nonce he bore alone, but he sometimes came (and looked not ill) in bearings of his own, which were gold with a green eagle; he was named Ralph de Monthermer. Robert de la Warde, I saw there; never was a ward the firmer than he kept upon his banner: vairy, was it, white and sable. John de Saint-John’s heir and namesake bore his arms with a blue label. Handsome knight and well beloved, Richard Earl of Arundel, richly armed with lion rampant gold on red, I saw as well; while to show that riches vanish, Alan de la Zouche there bore bezants on a scarlet banner. (Well I know he has spent more than his purse retains of treasure!) Comrades with them, marched the band sent by Durham’s noble Bishop, bravest cleric in the land, and of Christendie a mirror, wise and eloquent and good; never rich man lived more rightly: pride, greed, envy he eschewed; yet not lacking resolution to defend his cause amain were mild measures unavailing; by just conscience he was swayn. Well arrayed, with costly meinie, he was wont to ride to war; but this time, detained by duties, he accomplished his devoir to the King by sending soldiers to the number of eight-score; (not so fine a gift was Arthur’s, conjured by the spells of Merlin!) These were marshalled ‘neath his banner — gules, a fer-de-moulin ermine. High in honour, John de Hastings, by the Bishop well beloved, was appointed as their leader — rightly so, for he was proved in all feats of arms most daring, but in hostel mild and kind; never to impartial justice judge-in-eyre was more inclined. Strong and light his shield, emblazoned with a scarlet maunch on or, and the same was on his banner. This with a black label bore Edmund, his courageous brother, one who honour sought to glean; and the maunch was also carried, gold upon a banner green, by their friend John Paignel, gallant bachelor in love and war. Edmund Deincourt — he unable to attend in his devoir — sent instead his two good sons, entrusted with his banner blue, strewn its field with golden billets, and a dancette sur le tout. Prince and Duke and all men else held John FitzMarmaduke in praise; he on banner red a fess bore, white between three popinjays. Maurice Berkeley’s blood-red banner, crusilly with chevron white, was (his father being living) with an azure label dight. One whose heart was in well-doing, Alexander Balliol held a gold banner with a scutcheon scarlet voided of the field. And with these were other banners, seven-and-eighty, as I reckon, crowding towards Caerlaverock Castle. Not like chess-rook was it taken, but by thrusting lances harried, and by battering engines shaken. Mighty was Caerlaverock Castle. Siege it feared not. scorned surrender —wherefore came the King in person. Many a resolute defender, well supplied with stores and engines, ‘gainst assault the fortress manned. Shield-shaped, was it. corner-towered, gate and draw-bridge barbican’d. strongly walled, and girt with ditches filled with water brimmingly. Ne’er was castle lovelier sited : westward lay the Irish Sea, north a countryside of beauty by an arm of sea embraced. On two sides, whoe’er approached it danger from the waters faced; nor was easier the southward — sea-girt land of marsh and wood: therefore from the east we neared it, up the slope on which it stood. There the host, at the King’s bidding, was reformed in squadrons three, which the harbinger best suited; there the banners you could see bravely spread; and many a warrior trying out his horse’s pace; there stout men-at-arms three thousand; and aglow was all that place with gold, silver and rich colours. Those who watched us from the tower well might think that greater peril never faced them till that hour. Where the Marshal set the quarters, houses on all sides appeared, not by carpenters and masons builded, but of cloth upreared; many were their forms and colours, and by many a taut cord held; many a peg in earth was driven; many a tree for huts was felled; and to strew within the lodgings, leaves and herbs and flowers were culled. Timely came the ships with stores and engines; then the foot-men boldforward went discharging arrows, bolts and stones against the hold; but so fiercely the defenders sent these tokens back again that in one short hour were many maimed and wounded, many slain. When the warriors saw the footmen in their onslaught so dismayed, with all haste, for speech not staying, ran they — leapt they to their aid. also Robert Hamsart ready, with a gallant retinue scarlet with three stars of silver bore he on his belted shield. Henry Graham showed a saltire argent on a blood-red field, and therewith a chief of silver charged with three red scallop-shells. Thomas Richmond bore on scarlet a gold chief and two gemells. He, too, raised a force of lances, but they showed nor sense nor care, and, as though inflamed by arrogance and blinded by despair, to the very bridge advancing, there admission loud did claim. Straightway in huge stones and heavy the defenders’ answer came! Shield disdaining, Willoughby received a bolt within his breast. Resolute FitzMarmaduke endured as much as all the rest, standing like a stock, his banner marred by many a stain and tear. Hamsart fought so fierce that fragments of his shield flew in the air. Upwards these their missiles hurtled, while with many a heavy blow rained upon their heads, the Castle’s guardians sought to lay them low. Graham’s men returned not scatheless, for unhurt or shields unbroken were but two. With these were mingled many King’s men, but unspoken he their names and gallant actions, or my tale were never done. Strengthened were they by the meinie well-equipped of the King’s son, with new-painted shields and splendid, burnished caps and helms ashine, gambesons of divers fashions with silk, cloth and cotton fine. Dodging through the flying missiles. Cromwell — handsome man and bold -azure, bore, a white lion rampant double-tailed and crowned with gold; battered and defaced, his shield was. by the stones ere he withdrew. Next La Warde and John de Grey came, the contention to renew; ready found they the defenders with their bows and springals charged. Bravely then the Lord of Bretagne’s people to the onslaught surged; fierce as mountain lions were they, and their weapons wielded well, gaining soon the Castle gateway — but could not so quickly quell those who kept it that none others in the labour had a share. After them. Lord Hastings’ forces rallied to the fight, and there saw I John de Creting’s peril when one crept beneath his steed stabbing at it with an arrow — him the rider struck with speed; on his white shield Creting painted a red chevron with three molets. Bearing in an azure shield a dancette or and golden billets, John Deincourt rushed to the onset, and his duty well achieved. There the gallant brothers Berkeley many grievous blows received; and the brothers Basset — ermine, chief indented gules, they bore, with three molets gold the elder, and the younger scallops or.Great the press, but the defenders stubborn still the portway kept, for as one fell out exhausted, to his place another leapt; never thought they of surrender, and the fray continued fierce day and night and morn ensuing, even till the hour of tierce. All day long did Brother Robert those within the Castle fret grievously with stones incessant hurtled from the robinet, while against the walls he lifted three more engines of great power, devastating in their action, such that neither fort nor tower could withstand their mighty pounding. Still the foe unflinching stood until lifeless some were smitten; then at last their stubborn mood wavered, and dismay possessed them; for that man a missile found, not steel cap nor wooden target could protect from grievous wound. Now no longer could they suffer, and a pennon held aloft, sign that they for peace would parley; but an archer sent a shaft piercing him who held the pennon through the hand into the face; and he begged them to forbear him, for he sought to yield the place to the King, and all within it to his mercy and his grace. Word to cease the fight was given by the Constable and Marshal, and the garrison submitted, and delivered up the Castle. Of all ranks, but sixty left it — marvelled we they were so few; life and limb the good King spared them, and gave each a garment new. Joyous was the host in conquest; and the King his banner bade, with St. Edmund’s and St. George’s and St. Edward’s, be displayed; and with them, by right established, those of Segrave, Hereford,108 and him trusted with the keeping of the Castle — Lord Clifford. Then the war-wise King directed how the army should be led, by what roads and by what passes, through the hostile land ahead.